Despite the rain falling outside as I write this, I know summer weather is on the horizon. You know how I know? RHUBARB. We stopped in at the farmer’s market on the weekend and I picked up stalks and stalks of the most delicious rhubarb. 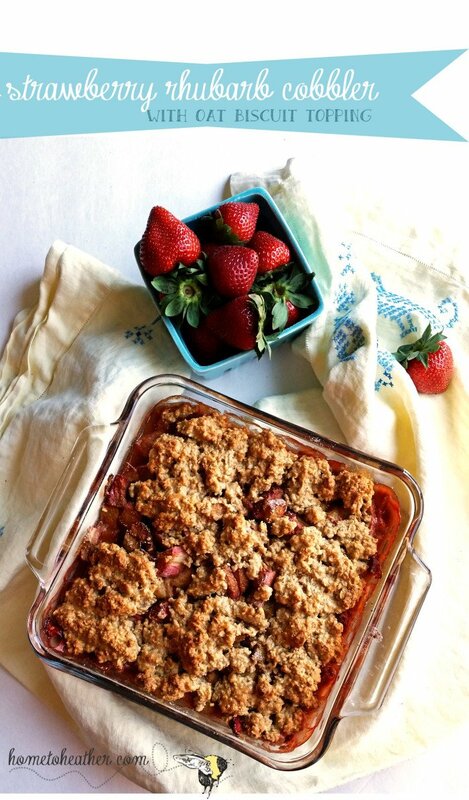 Nothing goes better with rhubarb than strawberries right? So we grabbed some of those too. Isn’t it funny how simple ingredients like these can make us think about times gone past. Good times, sitting in the shade on a hot day watching ice cream melt into fruit and savoring every bite. 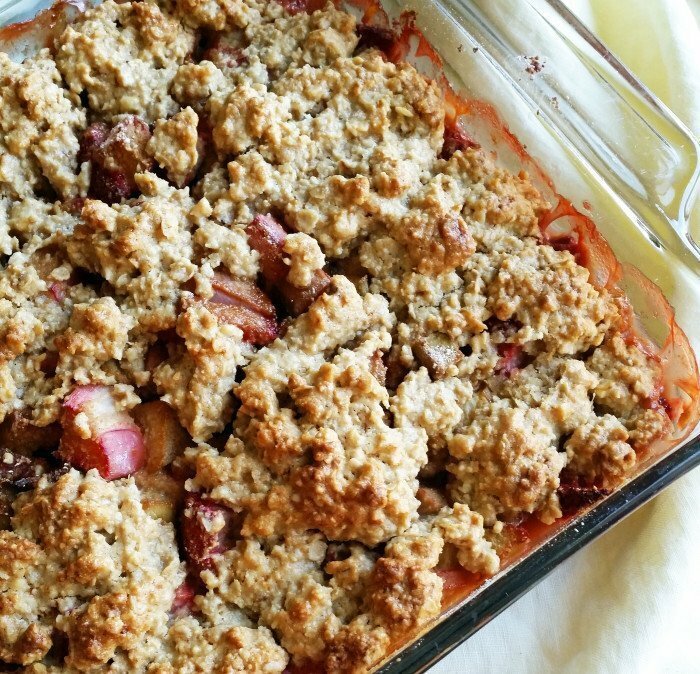 Strawberry and Rhubarb pie was my grandmother’s forte and my mother would turn these ingredients into a crisp with a brown sugar and oat topping. I decided to go for the best of both worlds and make a cobbler with a gluten free, cakey and sweet oat biscuit topping. I made a bit of whipped cream to go on the top but a really nice vanilla ice cream would suit just as well. This was a satisfying dessert and I felt like I just had something sinful yet this fruit based dish is pretty guilt free (aside from a little sweetness!) 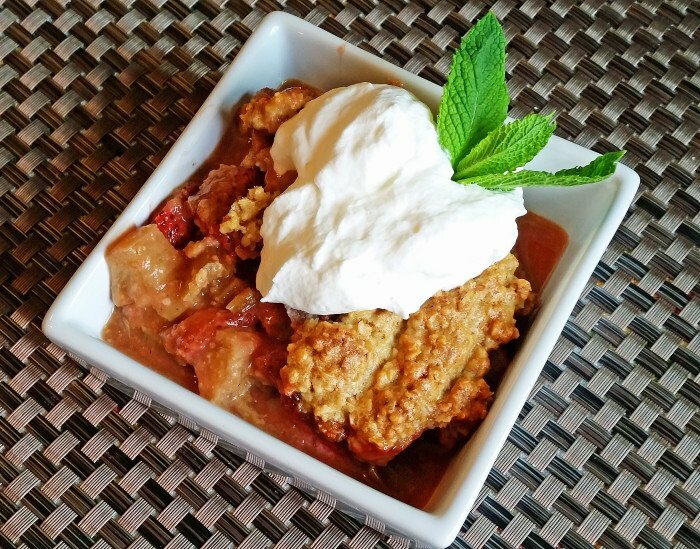 I used certified gluten free oats and oat flour, coconut palm sugar and organic fruits to put this together – it was a dish I was proud to serve my family and boy did they scarf it up! If you wanted to, you could substitute coconut oil for butter and almond milk for the cream to have a completely dairy free option as well. I went whole hog on the dairy though as it bothers me a lot less now that I’m not eating wheat. Chop your fruit and toss in a large bowl with sugar and flour until combined. Add in egg, butter and cream. Bake for approx 45 min until filling is bubbling and topping is nicely browned.